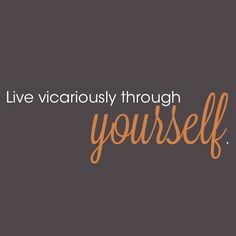 Today’s insight journey led me to the idea that living vicariously through others will only do so much for us. In the past I often made it a point to remain reserved, frequently hesitating to venture out and do new things. My friends and family members would start new businesses, enter into new relationships, and develop new hobbies. Yet, despite my interest in venturing into new territory myself, I oftentimes allowed fear of this or that to prevent me from going forward with something that would carry me into unknown territory. Instead, I opted to live vicariously through others while I remained on the “safe” path. However, living vicariously through others only provided me with a glimpse into others’ experiences, without ever satisfying my desire to experience those things for myself. And as the desire to experience those things continued to linger, I would promise myself that the next time that I had the opportunity to take part in those experiences I would do so. Yet, the next time only brought with it more of the same. In addition to leaving me with an unfulfilled desire to experience those things, choosing to live vicariously through others left me with a mounting list of regrets – If only I had done this…If only I had said that…And so on, and so on. Like many of us, however, I eventually reached a point when I decided that living vicariously through others was not enough for me, and I started making some changes in my life, one of the most notable of which was making it a point to say “yes” to good opportunities to which, in the past, I would have said “no” because of fear or some other negative element in life. And that one little change yielded amazing results in my life, broadening my horizons, and, in many ways, extending the reach of my sphere of influence in this world. This particular change was wonderful, and I wish that I could tell you that I have steadily continued to move forward in this regard without ever experiencing any hangups, but I cannot. As many of us likely have experienced at some point, I encountered moments when I, because of this or that, began to slide back into the old habit of living vicariously through others, and I found myself having to jumpstart the very same movement of change in my life that I had previously experienced. Was I disappointed in myself? Certainly. But I refused to allow myself to wallow in that pool of disappointment. Instead, I picked myself up and began moving forward, again.